So, I enjoy taking photo’s of many things. Lego is one of these things. Taking pictures at a fan expo such as Brickvention in Melbourne’s Royal Exhibition Buildings poses some special challenges. The light is variable during the day, and many areas of the buildings receive little direct light during the day. This is the first in an occasional series about how I go about taking photos of Lego. Today I will concentrate on the basic determinants of exposure, and the effect that they may have on the final image. I do not claim to be a professional. I don’t claim to have turned up to photography class. But it has occupied my time over recent years, and I believe I have something to offer. It is important to have some thing to believe in! The most frequently used cameras in the world, as far as online sharing is concerned, are the cameras in mobile phones. The quality of image has taken off in recent years. In real life, it is hard to easily adjust a lot of what you may see with your phone. How you can adjust your exposure, without going into complicated camera control apps. So, while the theory is sounds, not a lot can be influenced with phone-ography. So, I will concentrate on things we can influence with our cameras. While I will talk in terms of using an SLR, most modern ‘point and shoot’ camera will have a way of influencing these settings. So, What is a Photograph? In this digital era, photographs are the product of light reflected off an item, passing through a lens and an aperture, then being detected by a sensor. The ideal exposure depends on what you are trying to achieve, which may not necessarily be what your camera’s automatic setting is going to try. These factors all interrelate to affect the nature of your image. This refers to the relative sensitivity of the sensor. An increase in the ISO results in the introduction of digital noise into an image – this is typically reflected as speckling in the shadows and midtones of an image. In recent years, more advanced camera contain processing algorithms that aim to minimise noise in images with a high ISO. This can also be improved using a post processing program. 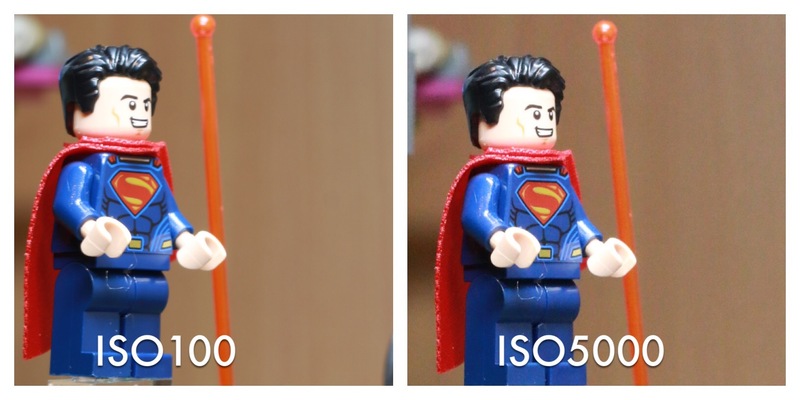 An image using an ISO of 100 will have significantly less noise than an ISO setting of 5000. The differences here are subtle, but some of the noise is apparent on the smooth yellow swell as the blue of the truck in the left foreground. If you double the exposure time, you double the amount of light hitting the sensor, but also allows for movement artefact or blur. A short exposure time allows you to better ‘stop the action.’ In the low light environs of an exhibition hall, a long exposure may mean that moving people become like ghosts. Some blur can enhance the impression of movement in your picture. The problem of movement artefact – blur due to holding the camera, even with a still subject – occurs when your exposure time is longer than 1/focal length of lens. e.g. focal length of lens 100mm, aim for exposure time <1/100 sec. Using a tripod will reduce movement artefact for these shots. Using a remote control trigger release, or a 2 second delay on the shutter timer can reduce the movement artefact due to the force of pressing the shutter release. You can see that only a thin band of the image on the left is in focus. a wide aperture was used, giving a narrow depth of field. What are overexposure and under exposure? We refer to an image as underexposed if there are regions where the shadows are so dark that no detail can be recovered readily. If it is overexposed, then the light areas are washed out, and may not be able to be readily recovered. As you can see, it is all made up of compromise. If you set a camera to ‘auto’ or ‘program’ mode in a poorly lit environment, it will often try to work with a wide aperture, which in turn will mean a narrower depth of field. As DOF is the primary thing I wish to vary in my pictures, I typically set my camera to Aperture Priority Mode (often labelled Av). I set the exposure compensation to -1/3 to reduce the exposure time and then attempt to boost the light in post production using light room. Typically using an ISO of 400 results in minimal noise with a contemporary camera. I use a a tripod where I can. If I have the time, I may drop the ISO to 100. This is rarely possible if the show is busy, but often exhibitors have access during quieter periods in the exhibition hall. Of course, this is just what I do. It’s certainly not the only way to go about it. It probably isn’t even right. I hope this discussion has helped you to understand the factors that influence the appearance of a photograph of a lego exhibit, and that it might encourage some to develop their photography skills. In the future, I plan to talk about lighting, using minimalist equipment, as well as the setup that might be used to take a picture of an isolated MOC or mini figure. Oh yeah… and more lego.